Now have your new CMS (Content Mangement System) website, hopefully, designed by us. Having a CMS website opens up the opportunity to easily add new content your website once such avenue that should be explored is blogging. There may be some debate out there as to whether blogging is still relevant in today’s environment with the abundance of social media sites such as Facebook and Twitter etc. In simple terms, a blog is a regularly updated website or web page that is written in an informal or conversational style. Regardless if you are a small business, sole trader, or even a charity blogging can be an integral part to your online presence helping to let your customers know about your products and services. Your blog gives you the opportunity to create relevant fresh content for your customers. Use this opportunity to promote your goods or the services you provide. Hopefully, your business already has a presence on social media such as Facebook, Twitter, Pinterest, LinkedIn, etc. Post links to your blog entries – with relevant visuals – of your blog articles to your social sites. Try and create an entry on social media that will give your social followers a reason to click through to your website. Blogs improve your SEO, as a result, your website will begin to appear high on search engine rankings. Fresh relevant content is still a key to outperforming your rivals in the search engine results page. When writing your blog try to include your key phrase’s or keywords i.e. a product name and it’s description. Also, add some point of interest. Think about how to make your blog post interesting to your reader that you would like to convert to a customer. Also, when writing your post don’t overlook the importance of using good English, no one likes the comments from the grammar police. Fortunately, there are tools that can assist such as Grammarly and the good old spellchecker. If you are a retailer, for example, write blog posts about your products. Your customers will get to know you as the knowledge source for the products they want. You are building trust, too. The more you can show that you are well-versed in your field, the more likely your consumer will trust you to supply what they need. Your customers additionally benefit from the learning you provide them. Blogs provide another source to deepen the connection with your customer. By connecting directly to your website, your clients are able to get to know your business or product. Additionally, just as on your other social sites, If you have comments enabled respond to any comments or questions and try to interact with your customer. If they have questions about a product you are writing about, respond to them directly on your website. Unlike many social sites, your blog will be generally searchable on your site for some time. Your website comments last longer than on a Twitter response or Facebook post. Your other customers will see your interactions too. 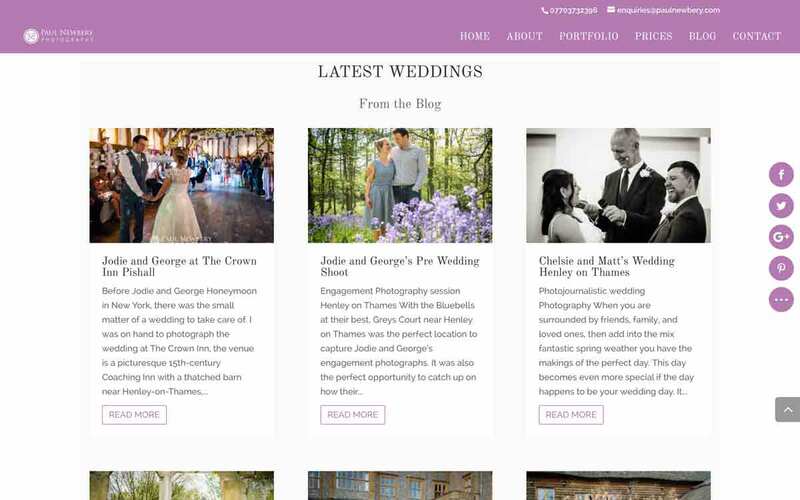 Below is an example of a blog, here the photographer uses his blog to talk about and showcase images from the recent weddings that have been covered. Would you like help creating a Blog?